Best remembered for his recording of ‘Cara Mia’, David Whitfield was born on 2 February 1926 in Hull, East Yorkshire. He was the third of eight children. His ‘singing career’ commenced with the local St. Peter’s Church choir when he was just nine or ten years old. He left school at 14 years and took up various jobs until he decided to join the Royal Navy at 17. He was a gunner and served in several phases of the war including the D-Day landings. He was also on one of the ships that went to the rescue of the trapped naval vessel in the Yangtze river. He enjoyed his life in the navy so much that even when he became an international star, he still had time to see his old colleagues after a show and talk over old times. Whilst in the navy, as well as singing for his and his shipmates’ pleasure, he started spending more time ashore in the Far East, entertaining the Force’s establishments. One of the more regular bookings ashore in 1948/49 was in Hong Kong with a nine-piece band formed by Ken Cochrane. David was the interval cabaret turn, but soon had to increase his repertoire… because he very quickly became more popular. The band leader was looking to create a cabaret show, and he enrolled a group of singers [called Tex Winter and the Tumbleweeds] from serving naval personnel. David was one of these recruits, and this is where his singing career really started to take off, a world away from his native Hull. He returned to England in 1949 expecting great things following his relative success out in the Far East. He entered a talent show in the Southampton area, but was disqualified because the rules stated the competitors had to complete their act. David couldn’t complete his song because the audience applauded so much the judges couldn’t hear the last part. In 1950 David was persuaded to enter a heat in the Hughie Green talent show Opportunity Knocks. He easily won, with the audience going wild in their applause. The manager came on stage after he’d sung and said, “To think I nearly turned this young man away.” He was offered a contract to tour with the show for eight months, also he broadcast regularly on Radio Luxembourg, a station listened to by millions in the early 1950s. The tour came to an end and for the first time in his life David was out of a job. He returned to Hull and obtained work as a coal-man’s mate and eventually a job in the concrete business. During this spell, he carried on with his singing, with part-time appearances in various clubs and talent shows. On 5 June 1951, he married his childhood sweetheart, Sheila Priestman, even though his career had not reached the heights they had both expected and hoped for. Out of the blue Hughie Green contacted him to appear at a concert at the Criterion Hotel, London in December 1951. His appearance received a tremendous reception from the audience, his first venture on a London stage being an instant success. Cecil Landau, a local impresario, was in the audience and later offered David a contract to sing at the Washington Hotel, also in London. January 1953 saw him in the Decca studios to record his first platter, ‘Marta’, with Nat Temple and his orchestra. Within four weeks of its release, it had sold over 20,000 copies, an excellent start for a first record from an unknown singer. His second record, ‘I Believe’, was selling better than the first and climbed the charts, despite competition from the American singer, Frankie Laine. The record eventually sold more than 75,000 copies. During 1953, David continued in variety, touring the country, and almost instantly achieved top billing. ‘Answer Me’ followed and toppled Frankie Laine from the top spot in the charts and went on to sell an amazing 700,000 copies, and this in spite of an objection to the words “O Lord” by the BBC, who banned that version being played on their airwaves. The ‘offending’ words being changed to “My Love”. At the end of 1953 and the beginning of 1954 virtually every record that David issued was an instant hit, with the likes of ‘Rags to Riches’, ‘Bridge of Sighs’ and ‘The Book’ all entering the top ten. It is said in the Guinness Book of Hit Singles that David had more records in the charts during the 50s than any other British male singer. We must remember that we had not so long ago come out from a long and costly war, money was still in short supply, so these sales figures are even more remarkable. In July 1953, David entered and won the International Song Festival [a forerunner to the present European Song Contest] in Knokke-le-Zoute, Belgium, the winning song being, ‘I Believe’. 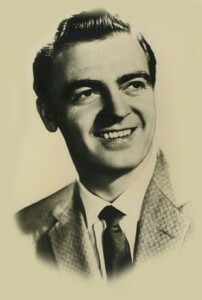 By the beginning of 1954 David had become one of the biggest Box-Office attractions in the variety theatre, appearing further and further afield. During March of that year he flew to Belfast to appear in the Songwriters Guild Concert, Our Friends the Stars, and, testament to his new status, he took with him the whole orchestra and company of London’s Victoria Palace Theatre. During 1954 he cut a record that was to be his biggest hit, and later his signature tune, ‘CARA MIA’. The song was first sung on 26 June in Blackpool where David was appearing in the Summer Show. At every performance it brought the house down, and on 1 July it was released on general sale. With the backing of the Mantovani Orchestra, it was sure to be a winner and by the middle of the month it was top of the Hit Parade, selling 300,000 copies by the end of the month. It was to stay as number one for almost three months, and in the charts for much longer. It eventually sold over 2,500,000 copies and earned David a much-prized Gold Disc, the first British male singer to achieve that honour. It is worth noting that in those early days, artists did in fact have to sell one million copies to achieve the gold disc. Other records followed, and in November 1954 David appeared before the Queen in the Royal Variety Performance singing ‘Cara Mia’, winning rapturous applause, and later being one of the chosen performers to speak to the Queen after the show. In just over a year he had shot from comparative obscurity to the forefront of the world’s top performers. Other stars on that show included, Noel Coward, Bob Hope, Guy Mitchell, Howard Keel and his ‘old sparring partner’ Frankie Laine. Celebrated company indeed! David went on to make two more Command performances, although one was cancelled at the very last minute due to the Suez crisis. Because of the success of ‘Cara Mia’ in Canada and America, David was invited to appear on Ed Sullivan’s Toast of the Town show, and sang two songs to an audience of millions. The reaction was amazing. After the show, the company’s [CBS] switchboard was jammed with calls from delighted Americans all demanding to know more about this unknown singer. He was the first British artist to break into the American charts, and was such a huge hit with the American public he was called back to appear on the show a further six times, a record for any British performer before or since. On David’s seventh appearance he had an audience of over 65 million viewers, and by 1956 there were 15 fan clubs in America alone. After one of his American performances he was noticed by none other than Joe Pasternak, the famous film producer, who invited David for a film test. Passing this test, he was offered a contract, but this meant that David would have to stay in America and give up his commitments elsewhere. It has been suggested that one of the reasons he did not pursue his film offer was that had he done so, he would not have been welcome back on the British variety circuit, and therefore would find it extremely difficult to get any national bookings. A form of Blackmail??? Another reason given was David loved his home country and would have been reluctant to move away. At the end of 1954 David convalesced in Switzerland following another bout of throat trouble which dogged him throughout most of his career, returning to England at the beginning of 1955 when he took over his role in Aladdin from Teddy Johnson, who had stood in for him. Another huge success for David. His four recordings that year continued the success story, all appearing in the top twenty, and staying there for several weeks. They were, ‘Beyond the Stars’, ‘Mama’, ‘When You Lose the One You Love’, and the most successful, reaching number 3, was ‘Everywhere’. He never had another No. 1 but always sold enough records to make him constantly Britain’s top male recording star. David’s next hit was ‘My September Love’. Entering the charts in 1956 it soared to number 3 in April and stayed there for several weeks. ‘My Son John’ and ‘My Unfinished Symphony’ followed but were not such big hits. By this time the Rock & Roll era was well advanced so a ballad singer like David was doing very well to be in the charts at all. Variety kept him busy throughout the year. ‘The Adoration Waltz’ was the last record of David’s to enter the top ten. It reached number 9 before going out by the end of March 1957. He also recorded the theme song for the film Sea Wife, starring Richard Burton and Joan Collins. The song, ‘I’ll Find You’, reached number 27. He was kept busy touring the country and the year ended with him returning to pantomime in the starring role of Robinson Crusoe with Arthur Askey and Tommy Cooper. More records were cut but none entered the charts, due no doubt to the upsurge of the rock era, but David was still kept busy in variety and in another pantomime, Humpty Dumpty. He starred in The Sleeping Beauty at Leeds and Liverpool an 1961, followed by Goldilocks and the Three Bears in Sheffield and Leeds in 1963. By all reports both shows were a huge success. In 1960 he made his first appearance in a musical, Rose Marie, to varied press reports but, in typical Whitfield fashion, he overcame the criticism and proved to be another huge success. He took this show around the country and played to packed houses night after night. The show started at London’s Victoria Palace on 22 August 1960 and finished at the Bristol Hippodrome in December 1961. This was followed by another musical, The Desert Song, which opened in Nottingham in April 1962, toured the country and finished at Sheffield’s Lyceum in the winter of 1962. Records were still being recorded but less and less frequently, however David still had his loyal followers and sales were good, but not good enough to gain entry into the charts. The re-recorded song ‘I Believe’ in 1960 was the last of his records to appear in the top 50 of the Hit Parade. Between 1954 and 1980 he toured the world. His travels took him to America, Canada, South Africa, Australia, New Zealand, the Far East and a Forces Tour to Malta, Tripoli and Cyprus. Wherever he appeared he was met with tumultuous acclaim, tribute to a truly great international star. On his 13th tour of Australia he suffered a brain haemorrhage and sadly passed away in a Sydney hospital on 15 January 1980, the evening before he was due to fly home, having completed another highly successful tour of that country.